PEOPLE are being given the chance to find out more about the £9m redevelopment of Putney rail station. The project will see three new lifts installed, the concourse area expanded, new ticket gates and toilets and canopy extension along the newly-lengthened platforms. 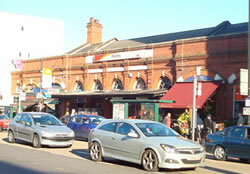 Work will begin at the station, on Putney Hull, in January by engineering firm the Spencer Group. The £9m redevelopment will be paid for by the Network Rail and South West Trains Alliance and is funded through the Department for Transport’s Access for All initiative. Ahead work starting, a drop-in session will be held for local residents, businesses and station users to find out more about the project. The meeting will take place at Putney library on Disraeli Road from 1pm until 6pm on the December 6. In addition, to complement the drop-in sessions, the project team will be providing updates on progress via leaflets and posters as the project progresses. Leaflets will be delivered to nearby properties and posters put up at the station. The MP for Putney, Justine Greening, who is the International Development Secretary, and former Transport Secretary, will be attending. The Network Rail and South West Trains Alliance is also working with Wandsworth Council to explore proposals to improve the area and pavement immediately outside the station. Contractors, the Spencer Group, will be on site from December for preparatory work, with the station redevelopment expected to be completed by the spring of 2014. During construction some temporary measures will be put in place as access to the main station will be restricted. This includes a temporary bridge as station users will be required to access to the main entrance via other platforms. Train services will not be additionally affected by the work as closures of the railway already planned. At certain times throughout the project, the main station building will be closed but alternative provision will be made to buy tickets.